This past summer I created a few bow ties for my own cat and shot some photographs for myself. After viewing them, I knew that this would be a fun project to do with the cats of Miss Kitty. In the beginning, I started shooting this just for fun. But after the first group of cats, I decided I wanted to make it a full series and came up with 101 Cats in Bow Ties. What is the purpose of the series? 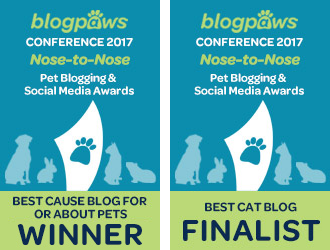 The goal and purpose of the Cats in Bow Ties series is to raise awareness for shelter cats by showing off the beauty and variety of amazing cats in the Miss Kitty community. As the creator of Cats in Bow Ties, it is my hope that all who see these photographs will smile, laugh, and feel that warm, loving feeling that can only come from looking at a cat. It is my dream that someone who has never considered adopting will head to a shelter – and that America will one day be a no-kill nation. What surprised you the most about taking pictures at Miss Kitty? I am surprised with how cooperative cats have been. Most of the cats don’t mind wearing the bow ties at all and seem to enjoy their portrait sessions. 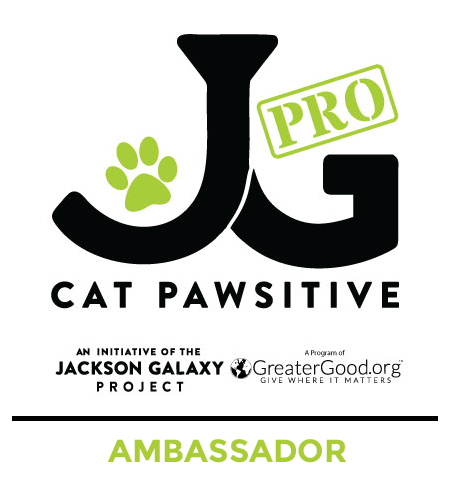 They like all the attention, extra petting, special toys and treats that are a part of the Cats in Bow Ties setup. Some of them refuse to pose and need to be bribed with catnip, treats, or feather toys. Several of them just flop over and want their bellies rubbed. It has been a lot of fun to shoot the series and also a lot of hard work. What is the hardest part about taking pictures? 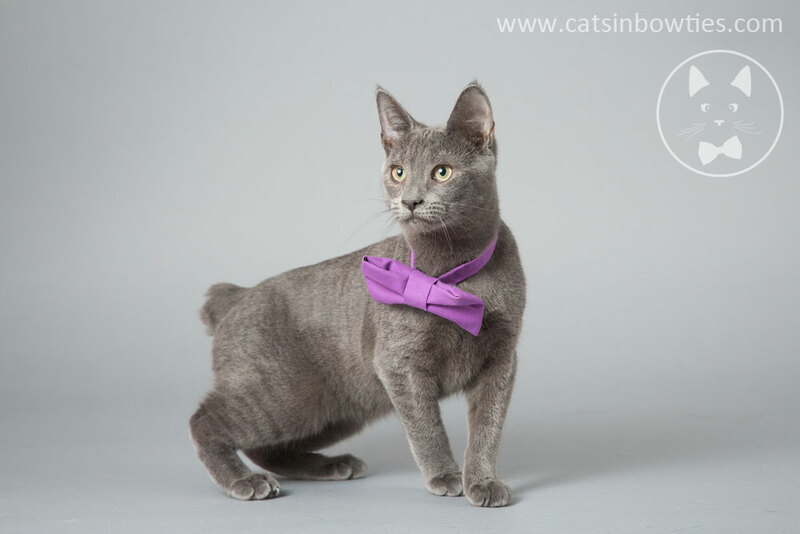 With the Cats in Bow Ties project, I changed how I photographed the cats by bringing in a full studio setup with lighting, a backdrop, and a wardrobe that I crafted by hand. For this, I crammed the whole setup at the end of a narrow hallway where it’s hard to move around but doable. Does anyone help you during the photo shoot sessions with the kitties? My sister-in-law, father, and one of my close friends have come along on some of the shoots to help in handling the cats. 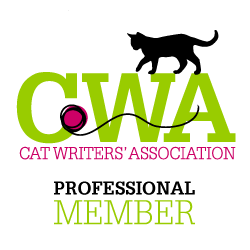 Have you photographed your 101st kitty yet? Yes, I photographed cat number 101 in February. What do you plan on doing with the series now? This coming summer I will be exhibiting the photographs in Thomasville, GA. I see you’ve started a Cats in Bow Ties shop. Does this benefit Miss Kitty? Yes, a portion of the proceeds from the shop are donated to Miss Kitty. To help support this wonderful photographic series and Miss Kitty, Three Chatty Cats has purchased a limited edition 4-pack of magnets for one lucky reader! 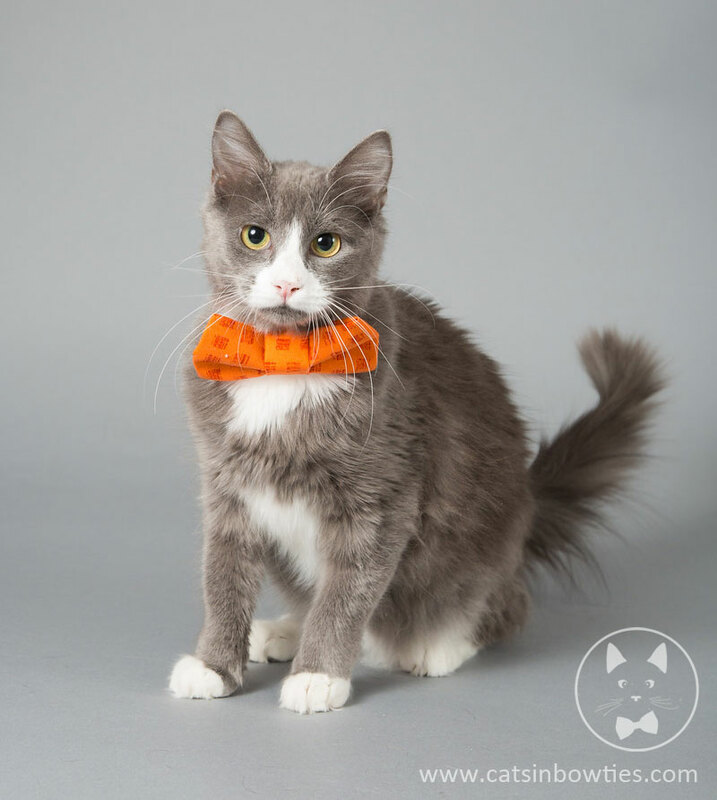 A portion of all proceeds from the Cats in Bow Ties shop are directly donated to the Miss Kitty Feline Sanctuary to help fund the lives of their resident felines. Giveaway: Leave a comment below by noon Pacific on Saturday, April 30, 2016 for your chance to win the 4-pack of magnets. One winner will be chosen via Random.org. U.S. entries only. This is not a sponsored giveaway. The cats have been working hard on making the magnets! 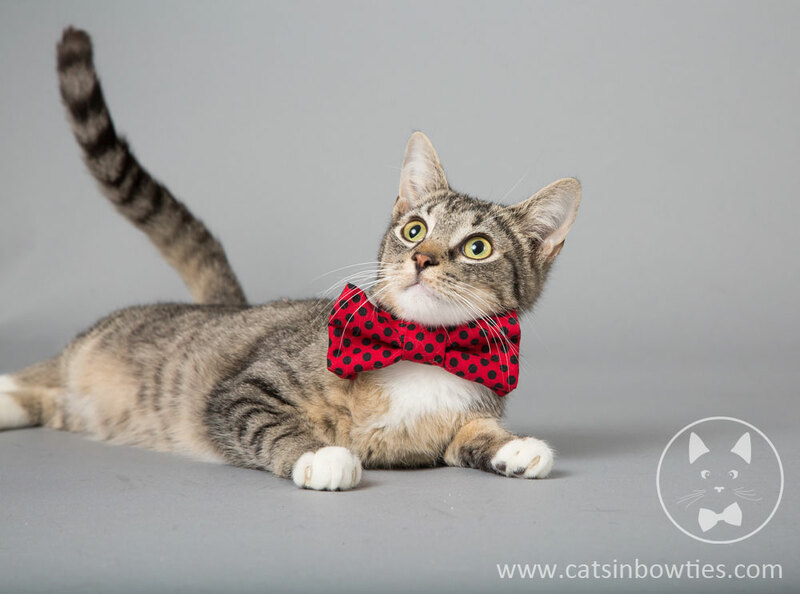 Thank you to Lindsi for sharing her photographic series Cats in Bow Ties with us! Her photography talents are exceptional and the series is so inspiring! You can connect with Lindsi via her website, Facebook and Instagram. You can also visit the Cats in Bow Ties shop to support Miss Kitty Feline Sanctuary. Bow ties look wonderful on mancats. I have a bow tie and wear it on special occasions. Love this series and the passion Lindsi has for the cause! I can’t wait to attend the gallery this summer. Love these! Lindsi’s cat photos are amazing. I want all the kitties!!!! I love this concept! It’s so cute! A book is a great idea!! Skippy always wears a bow tie. he is the charter member in the bow ties for mancats club. This is such a beautiful and heartwarming project!! And these pictures are so unbelievably cute!! I love cat in ties. Such stunning photos. Thank you for the kind words you left on our blog about the loss of Spooky. I love this campaign so much! 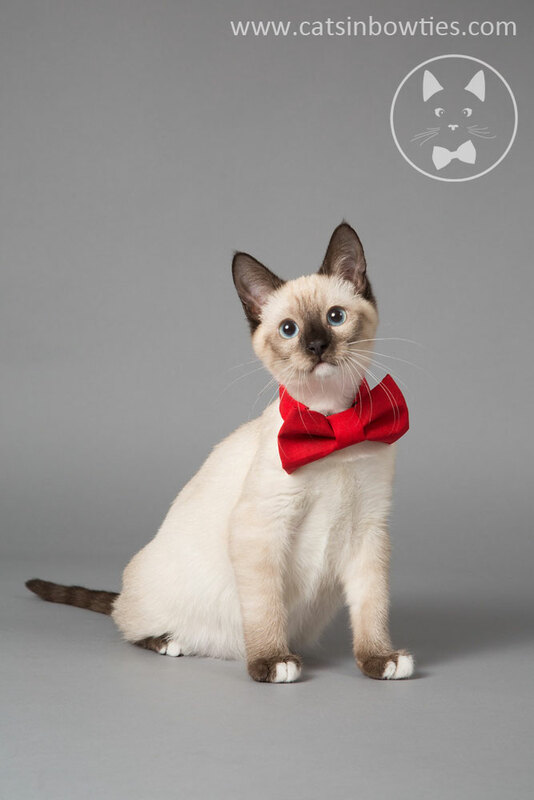 Cats in bow-ties is such a great concept and I found a few sites that have the cutest bow-ties!! Oh Meow luvved da magnet video. Those are all gawjus kitties. We wuld luv to win da magnets. Mommy would use one of them to keep me’s foto on da fridge. 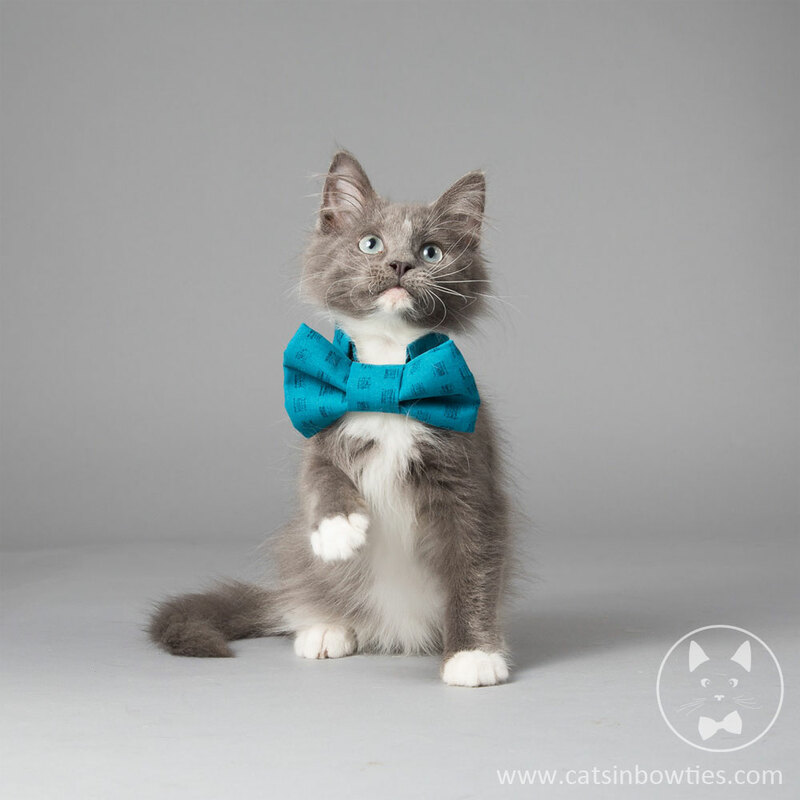 There is something so adorable about kitties in bow ties…what a fun giveaway! What adorable pics! And what a great way to promote these cats so they can find their furever homes. 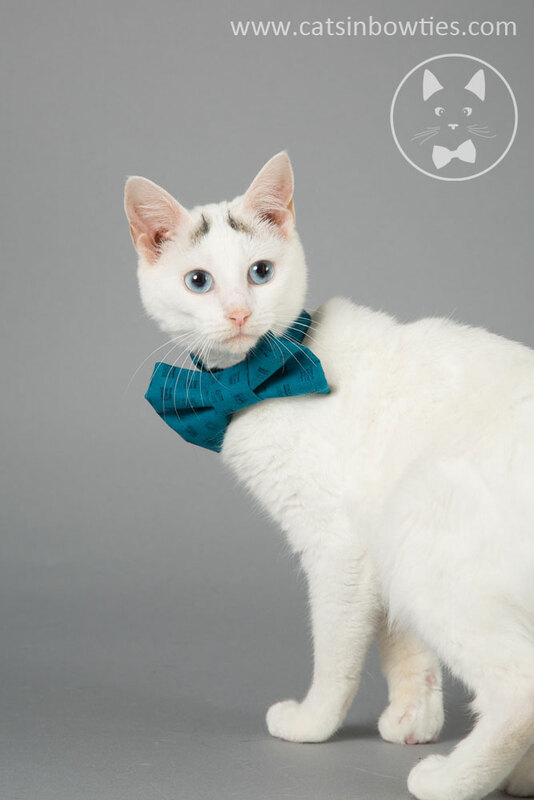 But the photo project of cats in bowties is such a great idea! I loved it. :-) Wilson used to wear bowties all the time back in Brazil. This has inspired me to buy him a new one! I need to get one for Dexter. I’m not sure he’d like wearing it though! It’s one of those things that you have to try. Wilson has long hair and it still didn’t seam to bother him. 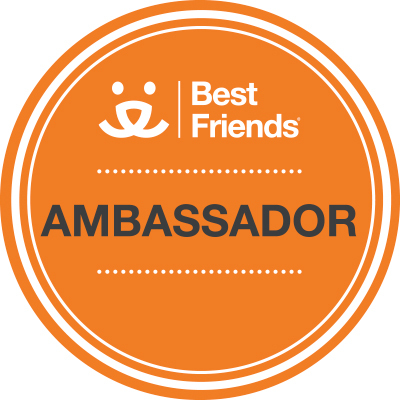 What a fun and unique way to raise awareness and show others how wonderful cats are! How adorable but she’d never get me into a bow tie. I have a thing about things around my neck. I go nutz. 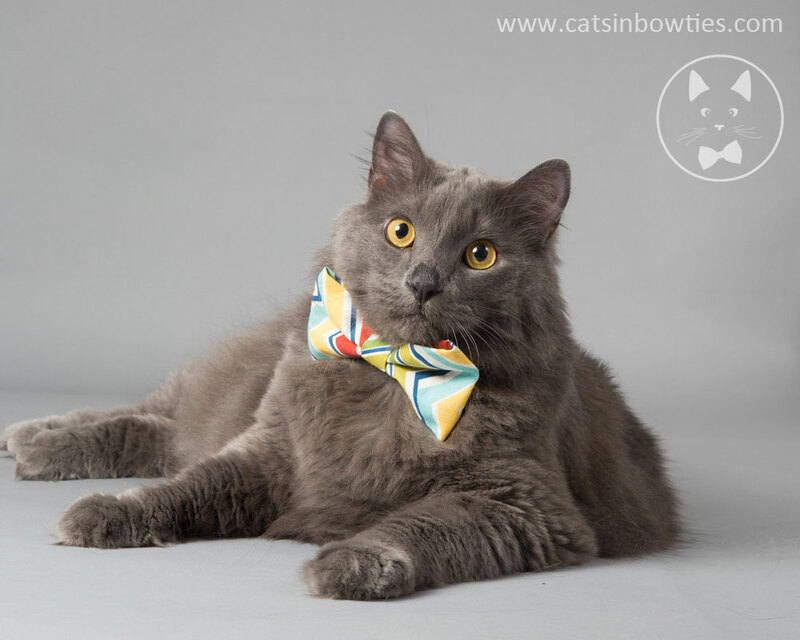 One of the cat bloggers makes bow ties for charity. These photos are so adorable. I adore them all, but the last one is my very favorite. I think Lindsi should put her photos in a book. Thanks for sharing. We have a similar project here at the Humane Society. 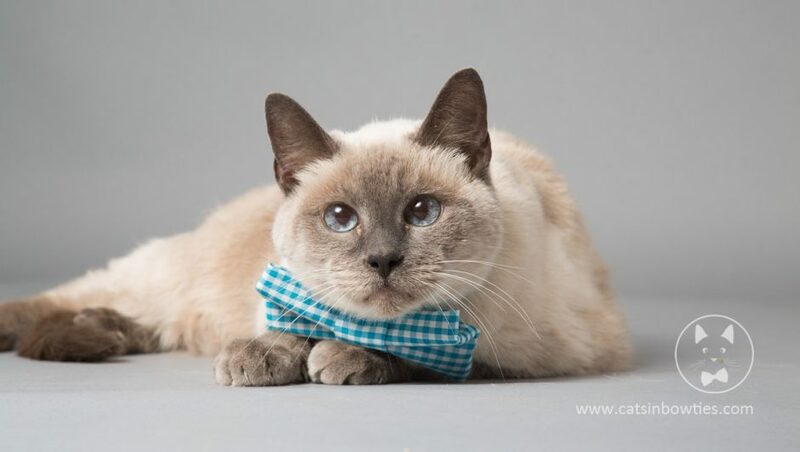 A bow tie maker donates a lot of her ties and the cats have their Petfinder photos taken with them on. That’s wonderful! A bow tie sure can make a kitty stand out. I love this project! The pictures and the magnets are adorable. Great way to raise awareness and show off some cute cats at the same time! Congratulations, you are the lucky winner of the giveaway! I will email you shortly. There is something special about cats in bow ties. Unfortunately our guys are so fluffy they don’t do bow ties justice – they just get hidden under all that fur. I love bow ties on dogs and cats. What a brilliant series of beautiful photos and a great idea to promote rescues. I love the bowties, are you considering a cat bow tie calendar for 2017? I think, well at least one of my cats would consider wearing the bowtie, she’s pretty cool. A calendar is a wonderful idea! I will pass it along to Lindsi. What wonderful photos and a great way to spread the word about adoption. I have flowers for my female cat but no bow ties for the males. I probably need to correct that! Flowers on kitties sound beautiful! Oh my gosh – so beautiful! I love the photos and the giveaway, spreading da word for adoption is fabulous!! Love the bow ties and what a great cause! They look great in their bow ties and what a wonderful cause! I love the video of the cat making magnets! Such a fantastic idea! We were a cat pack first and then came the dogs….and then another cat! 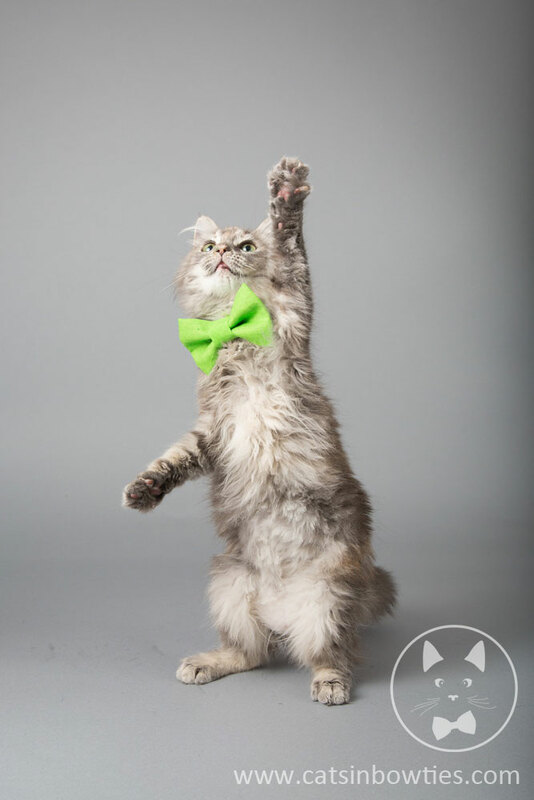 Adorable bow ties and beautiful kitty photographs! Aw how adorable! Love the photos! What a fantastic idea. These pics are delightful and the bow ties are perfect. I am tweeting it now, too. Mom Paula met Lindsi at BarkWorld. We really like her photos. Dr. Who says bowties are cool, and he must have seen kitties in bowties to have come to that conclusion! Now we need kitties in a fez! Such a wonderful idea! I”ve seen this for dogs but not cats – love it! Just to cute! I need at least 4 different ones to go down my hall. The cats in bow ties is tremendously cute. 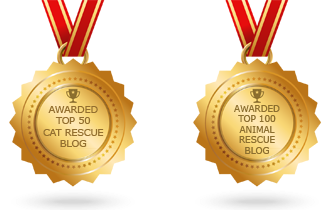 If I won these I would gift them to my favorite cat rescue group. This is a really unique concept. The bows (and general photos) help make the cats look (more) cute and approachable in a way that you do not seen in most shelter pictures. It catches the cats’ personalities outside a cage in a light that shows them when they are comfortable rather than behind bars. Keep up the good work! Just watched the video, I am behind. 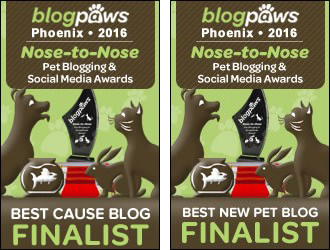 I love it and I am still amazed at the work she does for the kitties in my home state! Such a wonderful person and I enjoy her post post on Catastic as well. Would love to see you more Lindsi! I’d LOVE to use these on the kitties at the rescue I do the photography for! Too cute!!! 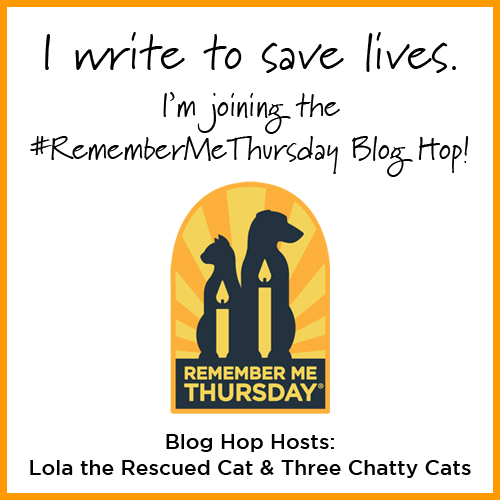 (Seattle Area Feline Rescue) I love all the amazing work of my peers. Kudos, Lindsi. Absolutely AWESOME! What a God given talent. So crafty and cute. Hello! My name is Jean Peterman of course as you will see my name after the comment that I posts. Miss Kitty is a wonderful place for cats to have a home where they are loved and taken care of, even though a forever home with a family is where I’m sure that they would love to be. Anyway, Miss Kitty has been very good to me, when I have needed food for the strays that I feed all over, I would call them and ask them if they may have some food that I could get, and they have never turned me down, unless they may not have any in at that time. Miss Kitty is definitely a blessing for all cats who are in need of a home or just simply some food to eat because they are always there to help in anyway they can. I have had the pleasure of visiting all the kitty cats at Miss Kitty, and they are all willing to give love, and hoping that you will have some playtime with them, and it really makes a difference because they know that they are loved, and they need that little bit of attention. I thank Mrs. Henderson and Miss Kitty for helping me when I needed it, and they still do, and I’am forever grateful to them. I love all the kitties there, and I pray that they will all get forever homes one day. Thank you Lindsi Jones for the beautiful photos of all the beautiful kitty cats there. You do an awesome job at photography, and you did a great job with all the cats. Entries for the giveaway are now closed. Comments are always welcome to continue, though! The giveaway winner will be announced shortly and selected randomly via Random.org. Thank you for all the entries! Lovely kitties. I love the bow ties on them. Love all Lindsy pictures! Love all She does for kitties! Thank You so much!